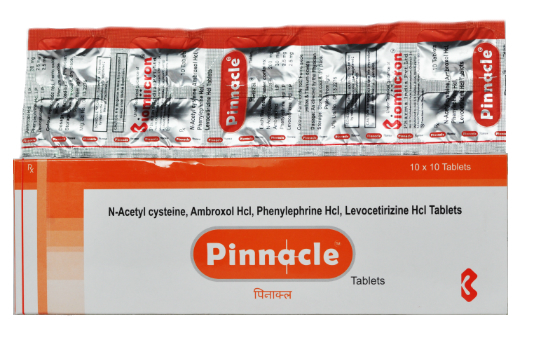 Pinnacle tablet is a matchless preparation from Biomiicron that contains N-Acetyl Cysteine which thins abnormally thick mucus in cystic fibrosis patients. Ambroxol and phenylephirine helps to decongest the air ways and Levocetirizine is an effective non sedative antihistamine which controls allergic reaction. It is very useful in the management of cold, cough, bronchitis etc. Packing: Available as 10 x 10’s strip pack.